It is one of my favorite star-crush stories, the time I met Spalding Gray. Two friends and I started a theater company in the summer of 1990. Perhaps you have not heard about it; it was kind of not-big deal in Poughkeepsie for almost two weeks in a row. Our endeavor yielded one sell-out performance in the open-air back porch of a bar, a bad review, yet one more (mostly unattended) performance, and a bunch of t-shirts. With grad school beckoning we shut it down, and with time and many residences I lost my only t-shirt and even eventually forgot the name of the “company” we had started. I found our one playbill at my parents’ house recently. We called ourselves “Fading Gentility,” which is a name some group really ought to be using, as it is a great one; our one play (a one-act that was written by one of us not named me) was titled “The Smoking Car.” Ah, well. Our best work was actually our group-written press release announcing our imminent debut production (the owner of our favorite bar had decided to allow us to try and earn our drinks, which lit a fuse under us)—the three of us took turns writing each sentence under the guidance of a copy of the “I Ching,” just so you know—and that press release got us an interview with our city paper’s entertainment maven. Being featured in the Poughkeepsie Journal’s “Enjoy!” section meant we were either going places, had arrived, or they needed space-filler. The attention from the local newspaper and our relentless 20-year-oldness landed us a sell-out performance. But one single one-act play that hardly lasts from twilight to night and no other material at all whatsoever will not lead to many drinks or dinners sold, which is the entire point of theater, so we saw few happy returns from the evening. That same summer, 1990, Spalding Gray was due to appear down the street from our venue, at Poughkeepsie’s historic Bardavon 1869 Opera House. Here was one more opportunity to attract attention for ourselves. Or to speak with an idol. Or to “network” with a theater legend. Or to stare at an idol. His monologue was the first act of a multi-act fundraiser, so after his performance, he was supposed to continue to be available for audience hobnobbing in the lobby, where a temporary bar was set up (the three of us looked at each other and thought aloud, that’s how they do it—even the theaters sell drinks!). We could not, or dared not, get near him. 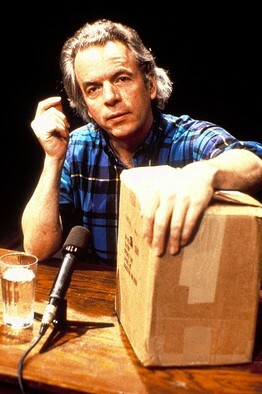 Spalding Gray stopped and turned. We were all at the front of the house at this point, by the stage. Someone in a position of authority ought to have been there to chase us away, but no one was. “Hi. We’re big admirers and we just wanted to let you know we started a theater company here in Poughkeepsie recently and you are a big inspiration and we just wanted you to have one of our t-shirts.” That all came out as one word, and the way I remember it, each of the three of us contributed at least a couple of syllables to my nervous blast of a star-struck sentence. Renee reached out a hand and my friend reached under his sweater to pull out the Fading Gentility t-shirt that he had waddled up and smuggled into the theater. She took it and handed it to Spalding. She asked us about the theater scene in Poughkeepsie, something we knew little about, although we were among the leaders of the theater scene in Poughkeepsie that summer. Thus it was a short chat. Spalding Gray looked at the front of the shirt, the back, the front again, and spoke as if to himself, “I get a lot of t-shirts. People think I like t-shirts. I like t-shirts.” That was all he said to us, though he said it twice. “I get a lot of t-shirts.” Goodbyes were exchanged and we all shook hands.